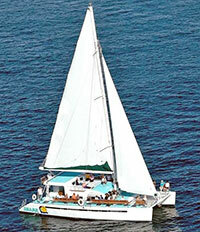 This is a great catamaran for groups that have varying age ranges. There is plenty of shade, two great front trampolines to take in the sun, proper bench seating along the sides of the boat, and a tiered deck for good viewing from all over the deck. Comfortable for up to 80 people, this catamaran features two bathrooms (ladies and gentlemen) on board, a table in the back of the boat where you can sit, a table and sofa inside the cabin, and a ladder for easy water access during snorkeling trips. During the winter months of December through March, known as whale season in Cabo San Lucas, this catamaran is very popular for whale watching. It is popular for snorkeling trips and relaxing sunset cocktail cruises throughout the year. There is music on board, an all-you-can-drink open bar available, and a good time to be had by all. Sail by Land's End and Lovers Beach, watch the sun set over the Arch, snorkel in Santa Maria Cove, you name it, the boat is yours!